Peaceful Mountain Lodge & Birdwatchers Paradise! Located in the tropical cloud forests of the Talamanca Mountains, three hours south of San José, Savegre Hotel Natural Reserve & Spa is a nature-lover’s paradise. 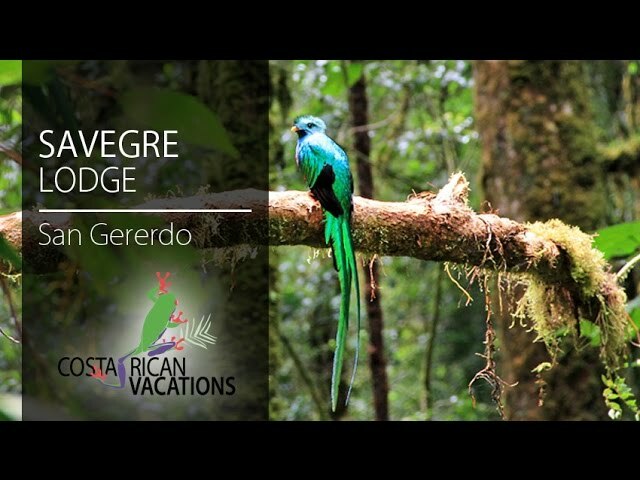 The family-owned hotel is located in a small community called San Gererdo de Dota and is the perfect secluded escape for nature-lovers, birdwatchers, couples, and families with slightly older children. Savegre Hotel is comprised of 50 guestrooms and sits on nearly 1,000 acres of private nature reserve! The guestrooms are rustic with simple furnishings and are surrounded by gardens with stunning views from the terrace. Rooms come standard with heater, safe, hair dryer, and coffeemaker. Rooms at Savegre don’t have A/C or TV sets, so you’ll have the chance to truly enjoy this rustic environment. Free WiFi access is available in the lobby and restaurant/bar area. Las Bromelias Restaurant offers both buffet and a la carte dining. Dishes are a blend of international cuisine and traditional Costa Rican favorites. Food allergies and special diets can be accommodated with notice. Other on-site offerings include a full-service spa, gift shop, convenience store, and extensive network (nearly 20 miles) of hiking trails. Hiking trails range from 1 (very easy) to 5 (physically challenging), and you will be able to see countless different species of birds, waterfalls, 200-foot tall trees, and even spot the legendary quetzal! The hotel is committed to environmental protection, having become certified through the Costa Rican Tourism Board with a Level 5 (highest available) CST (Certificate of Sustainable Tourism). Guests can relax in their rooms or in the hotel’s common areas, like the bar and restaurant which offer great cuisine and a relaxing ambiance. The hotel also has a superb spa, where guests can indulge in beauty treatments, massages and more. The hotel offers tours like cloud forest drives, waterfall hikes, and horseback riding across the property. The hotel’s location makes it the perfect setting to go on tours of Cerro de la Muerte, Los Quetzales National Park, Cerro Buena Vista, Los Santos Coffee Tour, Tolumuco Forest, and more! Just getting to the hotel is an adventure that you will never forget. Set in a valley with steep hillsides surrounding, it’s truly a remote location that even most Costa Ricans will never have the chance to visit.